Unwary residents of the Peshawar suburb of Hayatabad woke up one morning in early March to the noise of a battery of tractors and dumpers. 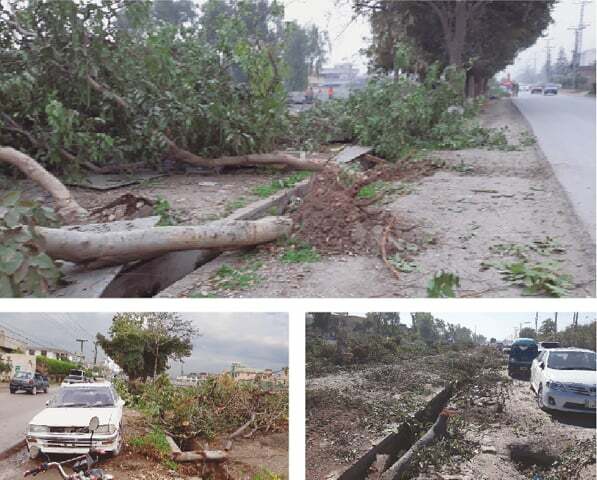 Much to their shock and amazement, this machinery had already begun razing the entire tree-lined belt across the Peshawar Development Authority (PDA) building of what used to be the most verdant area of Hayatabad. Named after former PPP Chief Minister of Khyber Pakhtunkhwa (then NWFP), Hayat Mohammad Sherpao, Hayatabad was first developed as a residential district in the in the late 1970s. And part of its appeal was the large tree lined boulevards. Despite development over the years, the founding fathers of the PDA had spared the centuries-old banyan trees and various other species in a one-mile stretch along the main service road of PDA building. This not just lent a serene ambiance in extreme weather but also provided a cool colonnade to the public, animals and birds chirping in the afternoon haze. This portion of Hayatabad was developed in 1978 and had a soothing effect on daily commuters. What compounds matters today, however, is the existence of a predatory timber mafia, allegedly working in cahoots with elements of the PDA. For instance, the timber mafia usually marks out hundreds of precious trees at the start of “contractor-consultant” planning around Peshawar and other cities. And in the present carnage of trees across the service lanes, the PDA has been unable to save a single tree across its own boundary wall, living up to the perception of “consultant-contractor” nexus. Had common sense prevailed this time round, the 10-yard-wide space comprising two rows of trees could have been spared for a cycling and a walking lane. These few hundred trees helped in providing oxygen, freshness, and much needed shade during the harsh hot weather — all of which have now been taken away. The original design reveals the BRT route was meant entirely on the historic Grand Trunk (GT) Road (also called Khyber, University and Jamrud road) from the outskirts of Peshawar till its final destination at Karkhano Market. “Political compulsions” resulted in a grossly misguided decision to bring the route inside Hayatabad, adding a further six kilometers to the original route. Those who have planned the BRT also decided to construct a BRT station across the Shaukat Khanum Memorial Hospital, seemingly to gain political mileage. But this has resulted in the destruction of precious old trees protecting Hayatabad during extreme hot season. Being the modern suburb that it is, Hayatabad has wide lanes and traffic congestion is never an issue. But needless stations and routes have been added, jacking up the original BRT budget, and compromising public interest for vested interests. In fact, a senior PDA official goes as far as to question the logic behind bringing the BRT route inside Hayatabad, and destroying its manicured green belts and huge shady trees. “This disaster was avoidable as there was ample space on Phase 5 and 3 entrances of Hayatabad, which could be utilised for final stations along the Jamrud road,” rues the official. A huge parking lot, as well as a taxi stand, would have secured business activities and facilitated travelers. Meanwhile, the GT Road today wears the look of a war-ravaged zone. All existing landmarks, roundabouts, manicured lawns and last vestiges of shady trees have been mowed down. The PDA gives an account of 25,000 trees having been felled but the actual number is much higher. It shall have an irreversible impact in terms of urban air quality, air and sound pollution, rise in temperature and health. For decades, the denizens of Peshawar have been at the mercy of policies which lack imagination, even common sense. Mega projects seem to be a buzzword for ‘development’ and largely ignore the socio-economic cost they entail. In 2016, the Pakistan Tehreek-i-Insaf (PTI) government was rightly credited with innovative traffic engineering that greatly eased traffic gridlocks. An investment of about one billion rupees was made on the beautification and upgrading of roads. But then came the Bus Rapid Transit (BRT) project — primed to be the PTI’s response to the transport projects being constructed by the Pakistan Muslim League-Nawaz (PML-N). Work for the BRT began in October 2017, even though the provincial government had only seven months left in office before the next general elections. Constructing the BRT became the responsibility of TransPeshawar, an urban mobility company set up by the Khyber Pakhtunkhwa (KP) government for the purpose. The project includes construction of a 26-kilometre-long route from the outskirts of Peshawar city (Chamkani) to Hayatabad that passes through Peshawar Cantonment and Jamrud Road, along with 31 stations where passengers can embark and disembark. The government desired to finish this project within six months — a tough undertaking given the huge traffic congestion and lack of alternate routes available to people during the construction phase. The BRT track — comprising surface, overhead and underpass stretches — passes through the busiest and most congested areas of Peshawar in terms of commercial plazas, restaurants, offices, hospitals, markets and educational institutions. As such, the four million people living in Peshawar and thousands of others who commute in and out of the city on a daily basis, using the GT Road and Jamrud Road, are undergoing immense health and financial distress. Despite warnings by experts, utopian planning by the policy makers has destroyed and denuded the aesthetic and ecological assets of a historic city. Climate change impact on the health and happiness of the population does not factor in any development plan. Chronic chest diseases are the leading cause of cancer and death. Leading experts in tertiary hospitals have reported an alarming increase in chest infections and deaths since the implementation of BRT. Individually, net business losses amount to approximately one million rupees. About 1,000 business outlets have closed while 3,000 have already shifted. Indeed, the BRT project has reversed the gains made in 2016 and also wasted precious resources. These could have been preserved had the design been less invasive and interventionist, at the cost of ecology. Independent experts and civil society could have prevented drastic remodelling of the infrastructure too. Although there is nothing dishonest about a sitting government initiating a project to gain public goodwill, and in election year more votes, the pace with which the BRT is being taken to its conclusion spells disaster for Peshawar. Earlier this month, the KP government removed the chief executive of the company, Altaf Durrani, for delays in the delivery of buses for the metro project. It was also alleged that Durrani was responsible for procuring an Intelligent Transport System (ITS) and hiring a vehicles operating company — neither of which he had accomplished. But the next day, the chairman of the TransPeshawar board, the chief financial officer and the general manager of operations and market development all tendered their resignations. These officials believed that the former CEO was adopting the approach of due diligence. This is a time-consuming process, and one that the provincial government could not afford since it has pledged to inaugurate the project before the upcoming elections. The British-built railway tract is universally considered the best available option for the BRT, traversing the entire circumference from outskirts of Peshawar, old city, Saddar and university areas and finally Hayatabad, across the Shaukat Khanum Memorial Hospital in Hayatabad, Phase 5. According to PTI officials, despite efforts, the federal Pakistan Railways did not grant a no-objection certificate to construct over their land. Political wrangling between the PML-N and PTI sealed the fate of this route option along the railway track that had greater cost-benefit advantages, was less resource-intensive, had a shorter construction timeline and was far less intrusive in design. The second best option was the Ring Road, running parallel to GT Road (renamed Khyber and Jamrud roads) from Peshawar’s outskirts to Hayatabad, and which runs a circle around the city. This route could have taken a substantial traffic load off the heavily congested GT Road, with provision for feeder lane service for transport in congested areas. “The development model in Pakistan is basically project-based rather than need-based planning for local communities,” argues architect Mohammad Khalid, an expert on urban planning in historic cities of Pakistan. He adds that planning a mega-project with a huge impact on the oldest metropolis in Pakistan needed to have various stakeholders on board. Khalid Ayub, an activist who heads the Karwan Tanzim, a body which represents the business community of Peshawar, argues that the business and trader communities have suffered immensely due to the construction of the BRT. “The approximate total business losses amount to a staggering 100 billion rupees and have affected about 70,000 businesses on the BRT route,” claims Ayub. When extrapolated, this loss is twice the total BRT budget in the long-term. The traders and businesses had offered to raise one billion rupees for the BRT in exchange for a business-friendly design. “An overhead train would have afforded cost-benefit and a public friendly option,” says Ayub. Over the years, public suffering in Peshawar has intensified. The trauma of war, destruction and insecurity is still fresh. But as people amble to normalcy, everyday tasks have become more difficult with population pressures taking their toll. Travelling times have become longer and arduous, for example, and traffic gridlocks have become routine. Broken and uneven roads are part of the landscape, fares and fuel costs have increased, air pollution has become extreme, and cases of pulmonary and respiratory diseases are also piling up. Although it was expected that, on completion, the BRT project would help provide cleaner air, reduce emissions, promote cheap and comfortable means of travel, and open more job opportunities in the public sector, the residents of Peshawar have had a rude awakening. When viewed through the prism of meeting environmental and public health challenges, the actions of the provincial government have come under great scrutiny and public ire. During the construction phase, for example, BRT contractors removed thousands of mature trees and destroyed green belts. This has led to increased dust and air pollution and the associated physical discomforts and ailments. Under the KP Environmental Protection Act-2014, it is an obligatory responsibility of the Environmental Protection Agency (EPA), environmental magistrates and environmental tribunals to take cognisance of public distress. They are also to adopt special measures to compensate the public for their ailments and economic losses to ensure adequate environmental governance. In the case of the BRT, the government seems blind to public distress as its environment arm has been unable to create environmentally sustainable plans that can fit into their model of development. Despite enacting the KP Environmental Protection Act in 2014, the KP government has not held a single meeting of the newly-established Environmental Protection Council to date. Under this law, the provincial chief minister is supposed to convene and chair at least one meeting per year to discuss important environmental policy issues. One way to evaluate the effects of sound environmental governance in the province is to compare it with various Sustainable Development Goals-2025. For instance, Goal 3 stands for ‘good health and wellbeing’, Goal 6 relates to provision of ‘clean water and sanitation’, Goal 7 pertains to ‘affordable and clean energy’, Goal 11 aims at ensuring ‘sustainable cities and communities.’ It appears that the KP government has not achieved any of these goals despite loud claims of being an environment-friendly dispensation. The BRT is just one example of poor environmental governance. In January, 2015, 25 acres of agricultural land belonging to the Agriculture Research Institute, Tarnab, Peshawar, was taken away for establishment of an Expo Centre. This decision involved changing land-use from agricultural to development sector, posing a threat to KP’s dwindling food basket. Earlier this year, another decision of the government was to change land-use for 400 acres of prime agriculture land in Palai, Malakand. This area was renowned for its citrus fruit. The land was handed over to Fecto Cement Ltd for the establishment of a huge cement factory. Such decisions do not conform to long-term environmental management, not only because precious agriculture land will be converted into industrial use, but also, because the cement factory will also cause irreversible air and water pollution and degradation of the mountain ecosystem. Then there are the challenges of supplying clean and sufficient drinking water to all citizens, collecting solid waste and its gainful management, urban air pollution from brick kilns and the stone-crushing industry, and deterioration of green belts. Unfortunately these, too, are challenges that the KP government has failed to address properly. This belies the impact that the Billion Tree Tsunami has had on the environment of the province. The Billion Tree Tsunami remains, for whatever its faults may be, unmatched by any similar projects in any other province. The big lament, therefore, is that, on the one hand, the environment is being saved painstakingly but, on the other, it is being ruthlessly taken apart. The Billion Tree Tsunami is inching towards its completion because it was better planned and executed while the BRT is being rushed through [See accompanying box, The BRT Balance-Sheet]. Why is there a seeming absence of consultation with the EPA on urban projects? Ahmad, too, credits the PTI government with achievements such as police reforms, health and education sector reforms. Legislation on the environment and local government, nevertheless, are sectors that still lack a tangible policy. Dr Faisal Khan, CEO, Science & Technology, Cecos University observes: “It is good to zoom out and think about the broader picture when opting for mega-projects such as the BRT in Peshawar. Meanwhile, the ruthless felling of trees has brought down the morale of the much-tortured souls of a city once known in history books as the “city of flowers and gardens.” No more, thanks to the government’s obsession to reshape the city into another Dubai. Previous articleInternational media wonders where Saudi crown prince MsS is?